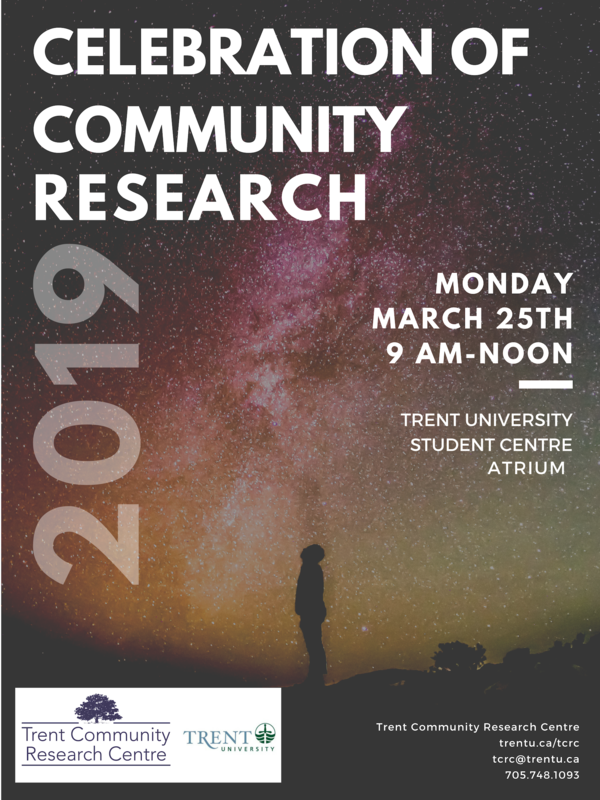 The Trent Community Research Centre will be taking place on Monday, March 25th, from 9 a.m. - noon in the Trent University Student Centre Atrium. Come out to learn more about the variety of community-based research projects Trent students have completed throughout the 2018/2019 academic year. As of July 1, 2018, The Trent Community Research Centre (TCRC) has been formally integrated into Trent University. For more than twenty years, the Trent Community Research Centre, and its predecessor, the Trent Centre for Community-Based Education, have worked in partnership with Trent University to create a unique community-based research and education program that has contributed to community organizations and experiential learning opportunities for students. The Trent Community Research Centre looks forward to strengthening and expanding its relationships in the community. 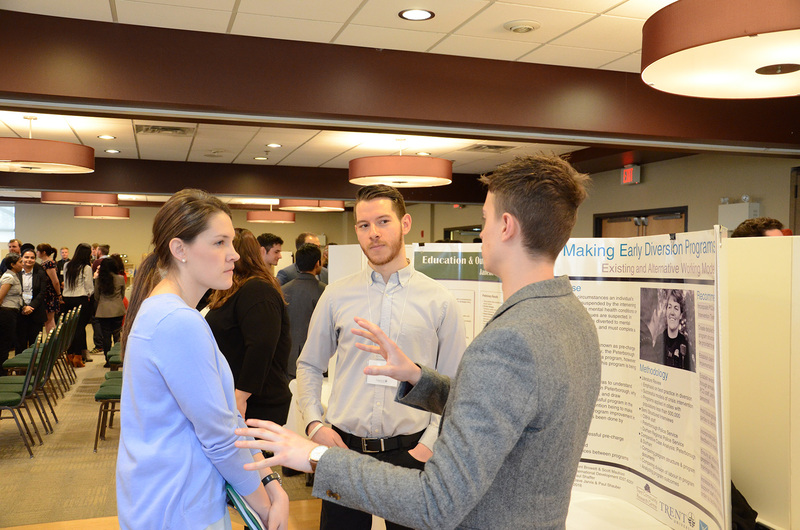 Through its projects, the TCRC continues to support local organizations and provide meaningful community-based research opportunities for Trent students. Community-based research brings together the knowledge and research needs of the community with the research expertise of Trent University faculty and students. Research questions come from a wide range of community groups and organizations including local municipalities, social service agencies, conservation authorities, and community interest groups. Organizations submit project proposals to the Trent Community Research Centre . Once projects have been reviewed by research staff, faculty and community experts, these opportunities are promoted to students and instructors. Centre staff work alongside faculty to support students in their work and help guide projects toward successful outcomes for both the local community and students. The work involved and time commitment needed for project completion can vary greatly. Community-Based Research (CBR) projects can be carried out as full- or half-credit undergraduate courses, undergraduate or Master's thesis, major research paper, PhD dissertation, or as an assignment within a course. Projects can commence at the beginning of Fall, Winter, or Summer terms. 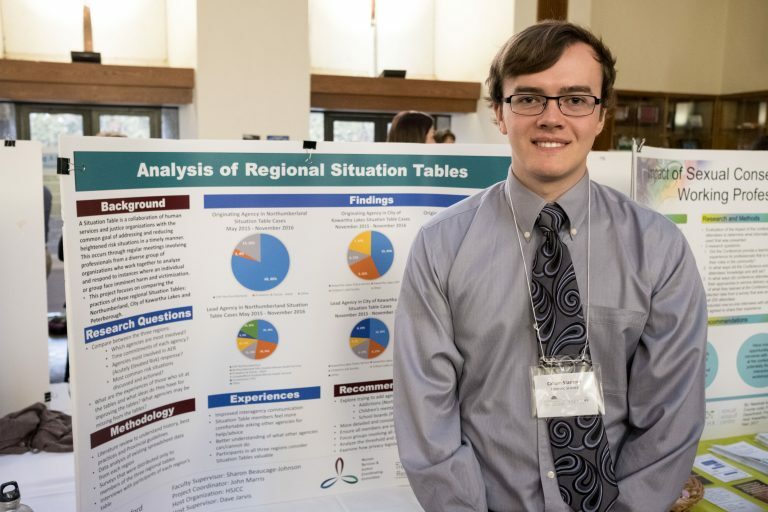 The TCRC provides support to students in the selection of projects that match their interests and program requirements, and ongoing support throughout their research. Learn more about the different ways of doing community-based research as an undergraduate or graduate student. 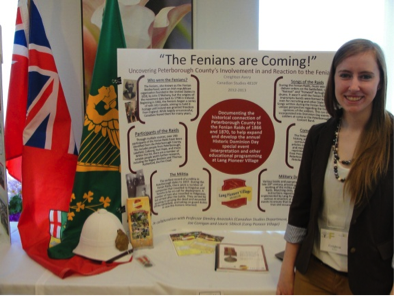 Every year, the TCRC supports over 100 Trent students as they do community-based research in the Peterborough area. The opportunity to do research that has an immediate, positive impact in their community often motivates students to do outstanding work. Browse the following examples of completed projects to get a sense of the exceptional work students do with us. Harper Creek is an ecologically sensitive area in the south end of Peterborough. 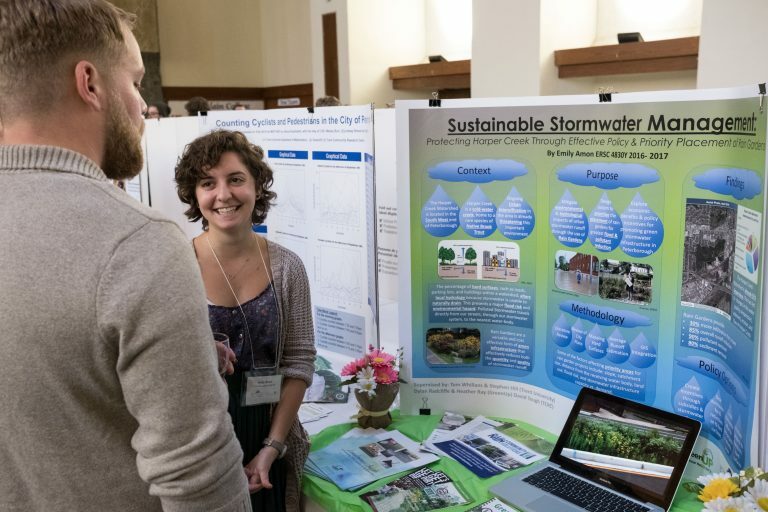 Increasing levels of stormwater runoff into the creek are one concern, so Emily’s project mapped the watershed to determine the highest priority locations for rain gardens and other projects that reduce runoff and mitigate flood risk. Emily’s project won the TCRC Academic Achievement in a Community Setting Award at our Celebration of Community Research in March 2017. Situation Tables are a new approach to delivering social services to individuals experiencing acute risk due to mental health, substance abuse, poverty, or other issues. They have been used in the Peterborough area for only a couple of years. Callum Stanford’s project evaluated their success and made recommendations for how they could be more effective. Callum’s project won the TCRC Community Impact Award at our Celebration of Community Research in March 2017. Early diversion programs reduce the criminalization and incarceration of vulnerable populations by diverting them away from the criminal justice system and towards relevant services and supports. Trent Browett and Scott Maufront studied Peterborough’s pre-charge diversion program in order to recommend how it could be used more effectively. Their results are already making a difference in how the Peterborough Police Service responds to at-risk individuals who have committed crimes. In 2015, the New Canadians Centre wanted to learn more about how residents of Peterborough perceived the city’s immigrant community. Sabina Thiessen conducted interviews, distributed questionnaires, and designed a focus group to help the New Canadians Centre find the answers they were looking for. Sabina’s research found that people’s opinions about immigration are generally positive, though there are also common concerns and worries about increasing immigration levels. In the past few years Lang Pioneer Village has showcased historical re-enactments of Fenian raids, but realized that their historical work could use more background research. Creighton Avery’s project documented the historical connection of the Peterborough area militia units to the Fenian raids of 1866 to 1870. For her efforts, Creighton was awarded the Innovative Presentation award at the 2013 Community Innovation Forum. If you have research questions you can’t find the answers to, we can help. We’ll connect your organization with passionate researchers to work on your behalf. Pursuing community-based research is a rewarding way to complete your education. Your research will answer important questions and will help to build a better Peterborough. If you have an idea for a research project, a community group you want to work with, or a student you think would be a good candidate for an independent project, please get in touch.